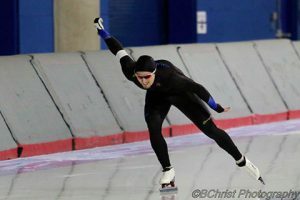 Here is the latest news from Guillaume Labbé, long track speed skater, who sent us his first chronicle for this season. “Back from Calgary after 3 weeks of training,” he says. “..came home pretty satisfied, with the 5th, 7th and 8th places in the Oval International at 1000, 5000 and 500m respectively.” For the young athlete, it was the first competition of the season. This one seems to be excellente, since Guillaume confirmed that he was performing “… very close to my personal best on each of these distances … I go as fast now as last year’s end competition, a very good sign for the season to come!”. Furthermore, the young skater from Baie St-Paul proudly announces: “For the first time, I was allowed to run the 1500m at the Canadian Team picking for the Fall World Cup!” At this competition, the skater finished with a 14th place in Canada, which is a new personal record. Guillaume ended his chronicle with on a positive note: “Next step is Canada Cup 1, in Quebec City from the 1st to the 3rd of December”. The Zamboni team wishes him the podium.